Dedicated navigation and value adjustment buttons - Redesigned controls make adjusting settings and parameters easier than ever, while reducing accidental menu selections. Help menu with menu-specific content - Simplifies service, maintenance and troubleshooting by allowing access to help screens from any menu. SmartWire™ system - Simplifies field sensor and thermostat installation with color-coded wires and terminal posts standardized across all models. USB Port - Allows technicians to download service reports and update firmware quickly and easily. BACnet/LON - Compatibility with major automation protocols allows complete integration with existing building monitoring and operation systems. The SmartAirflow® system is the only factory-installed option that prevents over-ventilation of light commercial units. SmartAirflow works with the Prodigy® Control System and an economizer to accurately and intelligently manage fresh air ventilation in buildings. 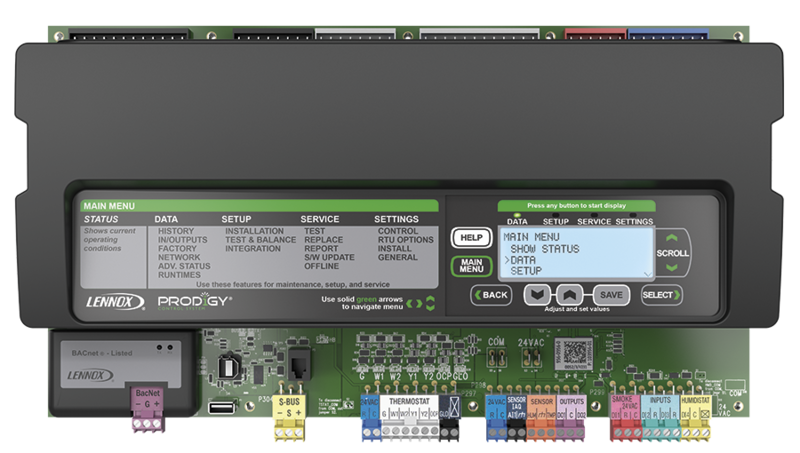 Learn more about the features of the Prodigy 2.0 Control System with our helpful How-To videos. Get step-by-step instructions on the basic controller navigation, programming the unit, using the Test & Balance option, set up for BACnet® operation and troubleshooting.